Angers Cathedral (French: Cathédrale Saint-Maurice d'Angers) is a Roman Catholic church dedicated to Saint Maurice in Angers, France. It is the seat of the Bishops of Angers. Built between the 11th and 16th centuries, it was classified in 1862 as a national monument of France for its mixture of Romanesque and Gothic architectural styles, especially the Angevin Gothic style, and for the stained glass windows, including the transept's window of Saint Julian, considered to be a masterpiece of French 13th-century glasswork. The original Romanesque church was rebuilt with Gothic details in the mid-12th century. The single aisle was vaulted with pointed arches resting on a re-clad interior elevation. The nave consists of three simple bays, with single bays on either side of a crossing forming a transept, followed by a single-bay choir, backed by an apse. The cathedral was originally dedicated to the Virgin Mary but in 396 Saint Martin, the Archbishop of Tours, added Saint Maurice to the dedication. He had acquired a relic of some of the blood of the members of the Theban Legion, who were martyred, along with their leader Saint Maurice, in the 3rd century for converting to Christianity. The relic was brought to Tours and later, according to legend, a phial of it was given to Angers. In the 7th century, a devotion to Saint Maurilius, the Bishop of Angers in the 4th century, began. A biography of him was written and in 873 his body was transferred to the cathedral. For 200 years Saints Maurilius and Maurice were frequently mentioned together as the patron saints of the cathedral but eventually Saint Maurice became the primary patron. At the beginning of the 11th century, Hubert de Vendôme, the Bishop of Angers from 1010 to 1047, wanted to build a new cathedral in the Romanesque style to replace the existing small and humble church. The new church was consecrated on 16 August 1025 but seven years later, in 1032, right after the completion of the construction, it was burned to the ground. However, Geoffroy de Tours, the Bishop of Angers from 1081 to 1093, ordered the reconstruction of the cathedral, which continued under the supervision of his successors, Renaud de Martigné (1102–1125), Ulger (1125–1148) and Normand de Doué (1148–1153). During the rebuilding, the altar crucifix was blessed in 1051 and the new altar was consecrated in 1096. The new church was finally finished in the first half of the 13th century, under the episcopate of Guillaume de Beaumont, the Bishop of Angers from 1203 to 1240. Subsequently, the cathedral underwent a series of changes. In the 16th century, the gallery, featuring the knight-companions of Saint Maurice, was built by Jean Delespine and the west front was added. The spire in the Renaissance style, with a hexagonal crown, was placed on the cusp of the north tower in 1518, and an identical spire was also built, in 1523, on the cusp of the south tower. During the Middle Ages, both Angers Cathedral and Amiens Cathedral claimed to be in possession of the reputed head of Saint John the Baptist, which had been brought to France from the Fourth Crusade but had since been lost. In 1806, the mediaeval porch on the west front had to be demolished because of its dilapidated condition. Built in the Angevin Gothic style in front of the entrance gate, it had two levels but four pointed arches are the only remaining evidence of it. Various reconstruction projects were developed in the 20th century but none of them went beyond the planning stage. The pipe organ has been in the cathedral from as early as the 14th century but the current version was built only in 1617 by the organ maker, Jacques Girardet, who was probably recycling the pipes and other parts from the previous organ. An earlier organ was replaced in 1416 with a new case by Jean Chabencel but in 1451 it burned down, struck by a lightning bolt. A replacement was built in 1507 on the initiative of Anne of Brittany on the original spot, the organ loft in the choir. It was restored for the first time, after a fire, in 1533 by Peter Bert and for the second time in 1701 by Marin Ingoult, who added the pedalboard. When Ingoult was done, the organ had, besides the pedalboard, 47 pipes with four keyboards (manuals). In the 18th century, its case was replaced. Between 1869 and 1872, the organ was reorganized by Aristide Cavaillé-Coll. In 1957 it was electrified, adding 19 pipes to make a total of 66 pipes, with just three manuals and a pedalboard. It is in the balcony of the organ loft at the west end of the cathedral. the straight staircase to the library built by Guillaume Robin, also in 1453, in the south transept. He supervised the construction of the cathedral at the same time as the master glassmaker, André Robin, made the stained glass windows. ^ (in English) Klein, Bruno (2010). "The Beginnings of Gothic Architecture in France and its Neighbors". In Toman, Rolf (ed.). Gothic Architecture, Sculpture, Painting. Potsdam: H.F. Ullmann. p. 34. ISBN 978-3-8331-1038-2. ^ Robin is a common surname in France so it is not possible to establish the actual relationship between the two Robins. Wikimedia Commons has media related to Angers Cathedral. 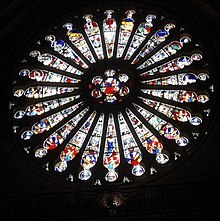 Complete tour of all the stained glass windows is at Painton Cowen's website, The Medieval Stained Glass Photographic Archive, under the title "Cathedral of Angers"
"Angers" . Encyclopædia Britannica. 2 (9th ed.). 1878. p. 29. "Angers" . Encyclopædia Britannica. 2 (11th ed.). 1911. pp. 8–9. This page was last edited on 14 April 2019, at 01:56 (UTC).